-Fixed untranslated text from Manager Mode that was missed. -Converted KM/h to MPH using CB's method. 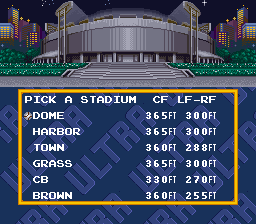 -Added Stadium Sizes w/ converted Meters to FT.
-Corrected some minor GFX issues. -Fixed a lot of translation text issues. 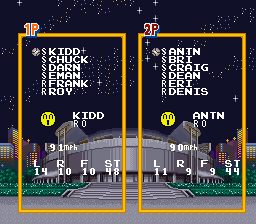 -Fixed the Inning/Game display issues for season. -Added option to play a full 162 game season (MLB standard). -Added player and team locations in ReadMe (for hard code-hacking). -English Fonts have been replaced. -Most Menus and Kana have been translated. -Some Kanji has been translated. "This is the ultimate baseball game! Precise pitching, bulls-eye batting, and Awesome fielding! It's all under your control with simpler yet more sophisticated operation. 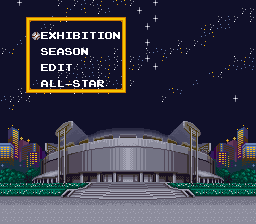 With loads of features, you'll be an All Star! It is the ultimate baseball simulation you've dreamed of." 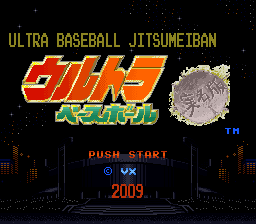 Ultra Baseball Jitsumeiban (or Real Names Version) is the third game released in the Ultra Baseball Series. The first two games were released in the US under the titles of "Baseball Simulator 1,000". The Baseball games are unique as they allow players to fully edit and automate entire leagues and seasons. 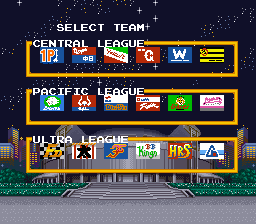 Additionally it's the optional "super power" Ultra League that gives players the unique ability to well....play some very wacky baseball! -Ultra Baseball: released in 1989 for the NES as "Baseball Simulator 1,000". 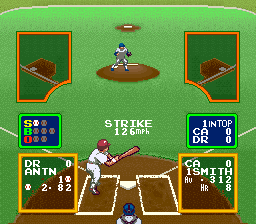 -Super Ultra Baseball: released in 1991 for the SNES as "Super Baseball Simulator 1,000". -Ultra Baseball Jitsumeiban: released in 1992 for the SNES in Japan only. 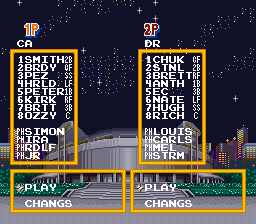 This is basically Super Ultra Baseball w/ real names (Jitsumeiban means Real Names Version). The graphics and sound are slightly better, and there is a new pennant option but this obviously uses the same engine. 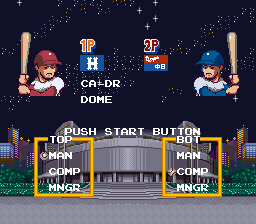 -Super Ultra Baseball 2: released in 1994 for the SNES in Japan only. Culture Brain planned to release this title as "Super Baseball Simulator 1,000 2" but canceled shortly after. This game uses a new engine and sports more features - yes this project is in the works too! -Ultra Baseball Jitsumeiban 2: Same engine as SUBB2, but with real players and some additional features. Most of this game has been translated into English by Tuffy da Bubba and is currently being revised and completed along w/ SUBB2. -Ultra Baseball Jitsumeiban 3: 1995, new engine, completely players even have numbers on their jerseys. -Pro Yakyuu Star: 1996, same engine as UBBJ3 but cartoon mode only and no ultra powers. We released a full PDF manual for UBBJ that you can download. -Some text is cut short or abbreviated due to space restrictions. -All other issues should have been resolved. Jitsumeiban as the title suggests is the "Real Player Version" thus this game used real players from NPB. It would have been too time consuming to have romanized players names and anyone who actually cares about the real players would more then likely speak Japanese and not have a need for this patch. So you want to avoid the limited edit mode and hardcode your edit into the ROM eh? Well don't ask me what codes change what, I didn't bother w/ that and won't...but here's the locations to get you started. Second team - DRAGONS: 0101 $18033 and so on.